AgCareers.com asked survey respondents how often employers contact them after an interview, even if they don’t receive an offer. Nearly half (43%) said they were “rarely” or “never” contacted by employers after an interview. Interestingly, respondents over the age of 60 were more likely to say they never heard back. We asked participants if an organization has ever asked them to give feedback on their candidate experience with them. The clear majority (78%) said no. So, the clear majority of agriculture and food candidates are not asked for feedback on their candidate experience. Does follow-up really matter if you are rejecting a candidate? Even though a candidate doesn’t make the cut for a current opening, there is a chance they will be a fit for a future opening with your organization. AgCareers.com asked candidates if they had ongoing engagement and communication with employers even if they aren’t offered the current job opening. Eighty-four percent of candidates said they had some form of continued communication with employers, even if they were rejected for the current job opening. 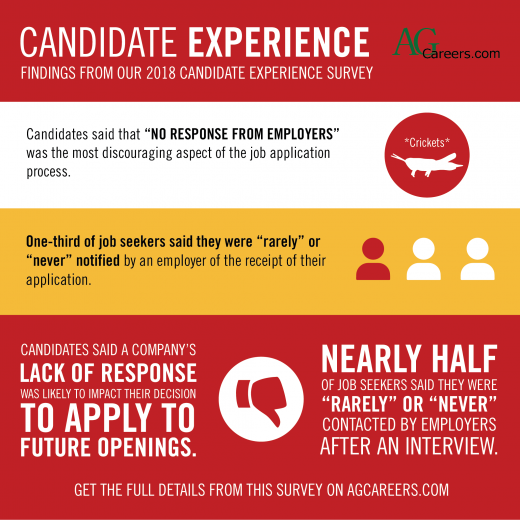 Find out more about improving your candidates’ experience; view the full results of the 2018 AgCareers.com Candidate Experience Survey here.